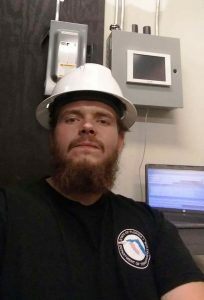 Daniel, 25 from Milwaukee, Wisconsin, is a United States Marine Corps veteran who graduated from the Electro-Mechanical Technologies program at Tulsa Welding School, Jacksonville, in September 2018. Thank you for your service Daniel, and for your time today. Tell us about your background. After high school, I spent a year and a half in the concrete business. It was interesting, but you can only spend so much of your life toiling in the hot sun doing grunt work. After that I went to the United States Marine Corps for four years. While in the Corps, I fought in northern Iraq as an artillery cannoneer providing fire support to Navy Seals and the SAS. I got out in August 2017 and wanted to use my GI Bill benefits to go to a trade school. That’s when my wife Andrea and I moved down to Jacksonville. She works in the medical field, and there are a lot of opportunities down here. It’s also a great area for HVAC. What made you choose a career in HVAC? One part is my family connections in the field. My grandfather was a master electrician back in the 70s and 80s, and my older brother is in the HVAC field up in Wisconsin. He works a lot with heat pumps and heating equipment. I knew my job would be focused on cooling here in Florida because of the extreme heat and humidity. The other part is, from my personal experience, working in extreme arid heat, or heat and humidity, or dealing with extreme cold, that I realized how important HVAC is to modern life. This is a field that isn’t going anywhere. So you moved to Jacksonville in August 2017. Is that when you enrolled at TWS? I first tried HVAC classes at community college down here, but I found out it was rather misleading. Some semesters they would have classes open, but some semesters there would be none available. It was hard to see a timetable for actually getting a degree. That’s when my wife mentioned Tulsa Welding School to me. She said they had an accelerated program that gets straight to the point. I decided to give it a chance because it had all the classes I was looking for in one straight shot. Did you take a tour? I did. It can be difficult for a young person getting into the trades to know where to start, to know what school has the right program. But when I went in to TWS, the staff were very courteous and answered all my questions. Tulsa Welding School in Jacksonville is more than just welding, it’s multi-faceted. You obviously have welding classes, but also electrical, air conditioning and refrigeration classes. I looked into all their different programs. Why did you choose the EMT program? When I saw they had air conditioning classes, I was very interested. They had a seven-month Refrigeration Technologies program, but as I was using my GI Bill military benefits I wanted the biggest bang for my buck. That’s why I chose the nine-month Electro-Mechanical Technologies (EMT) program. I knew that program would give me core electrical knowledge that would be useful in the trade and that would make me more competitive in the job market when compared to others. What was your favorite part of your experience at TWS? I’d have to say everything was my favorite! What really made the classes interesting were the quality instructors. They made coming to class fun and enjoyable every day. I had a very close relationship with my instructors. I almost felt like I was already in the trade. I saw them as the professionals they are and that’s how they conducted themselves. I wanted to emulate how they were, to further my development as a professional. I almost felt like I was their apprentice. Was there a good balance of book work and hands-on application? There’s a great amount of hands-on time. There were days when I actually thought I was working because there was so much hands-on. I’m currently employed at Nelson & Company here in Jacksonville. We deal with the sales and service of a wide variety of air conditioning brands in the commercial, institutional and industrial markets. I’ve been with them about a month. Career services helped a lot when it came to finding prospective jobs, but when I saw an opportunity for this specific job, a job that is somewhat rare, I took it. My wife Andrea and I put out an application. Then I had a phone interview, followed by two in-person interviews. This company vets their employees well. It was hard to get in with them, but I think my prior military employment helped me. How was getting your first paycheck with them? I was happy with the check. Even if it’s $2 more than the competition, it will definitely pay off with more time in the field. I know I have to start at the bottom and work up. I work for a team of professionals, and I’m amazed by their skill and professionalism. I hope that within a couple of years, I can be half as good as they are right now. So far so good, then? I have to say I’m really happy with everything so far. Tulsa Welding School gave me the opportunity to be successful in this field, and also really quickly. If I was at college, I’d still be waiting for classes right now. What’s your career plan from here, Daniel? I’m looking to be in this for the long haul. My parents never really had stable professions, but the skills I learned at Tulsa Welding School, skills that are being fine-tuned by my employer, are invaluable in the workforce nowadays. This is a stable career; I hope to stay with Nelson for the foreseeable future – maybe the next decade at least. I want to learn from the best. Knowing that I have the understanding, capability and confidence to fix complex issues when it comes to HVAC technology. What makes me proud is being able to help the community that I live in—helping schools, hospitals, restaurants and other businesses with their heating and cooling issues. At the end of the day, it’s a good feeling to know I’m helping people. What advice would you give to students considering TWS? Treat it like you’re already on the job. Read every chapter, go over the chapters you read the week before, watch YouTube videos and basically get an understanding of air conditioning from the smallest part to the most complex unit. There’s always something new to learn every single day.